It is the season for giving thanks, and this year, we have so much for which to be thankful. We're thankful for our staff, our volunteers, and our KNOM community, all of whom go above and beyond, every day, to keep KNOM broadcasting throughout the rural stretches of Western Alaska. 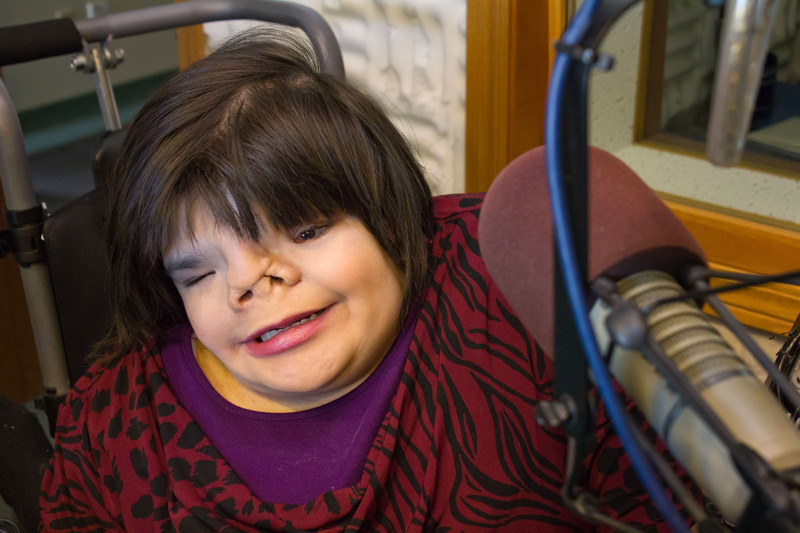 In Deejay and Advocate, below, you'll find a profile of one of these people – Tuesona Tungwenuk – who not only deejays at KNOM but also advocates for disability awareness. We're thankful for the legacy left by our founder and friend, Tom Busch, who passed away a year ago this month. As you'll read in Tom's Legacy, a Year Later, his last dream for our mission – the renovation, expansion, and digital conversion of our studios – remains a top priority, thanks to your generosity. We're thankful for the members of our KNOM family, both in Western Alaska and across the country, to whom we have dedicated our latest award. You'll find more below. We're thankful for our listeners, who are both the reason we are here and, day after day, the reason we keep going. As you'll see in Leading the Conversation and Celebrating Entrepreneurs, our listeners' dedication and care for their communities and their entrepreneurial spirit continue to amaze us. Most of all – and more than ever – we're thankful for donors like you: donors whose generosity makes our mission possible. We take your support very seriously and make every effort to be as wise as we can with the funds we've received. In fact, in Tax Break for IRAs, below, you'll find an important advisory regarding donations from IRAs that may save you money! Thank you for all you do for us. The prayers, financial support, and kind words we receive mean so much. Know that you are in our thoughts and prayers, as well. May God richly bless you now and always, and from all of us at KNOM, Happy Thanksgiving! 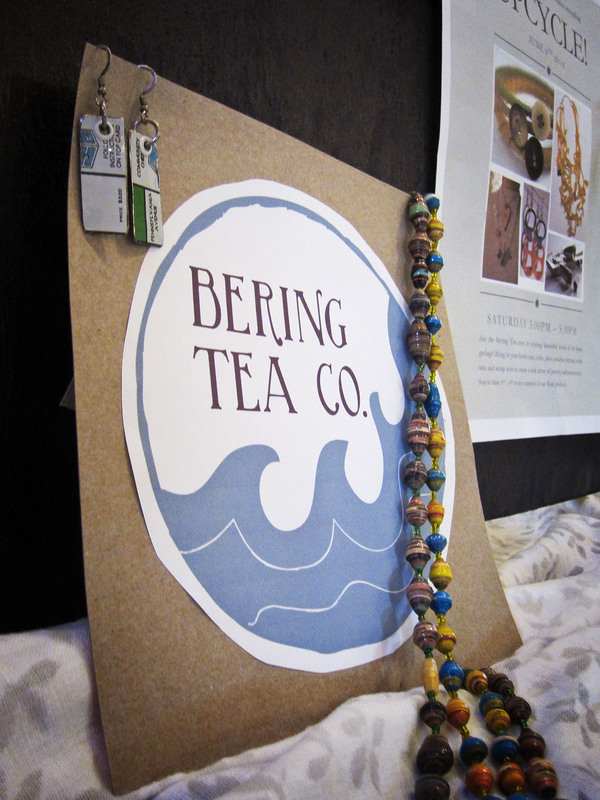 We have very exciting news to share! 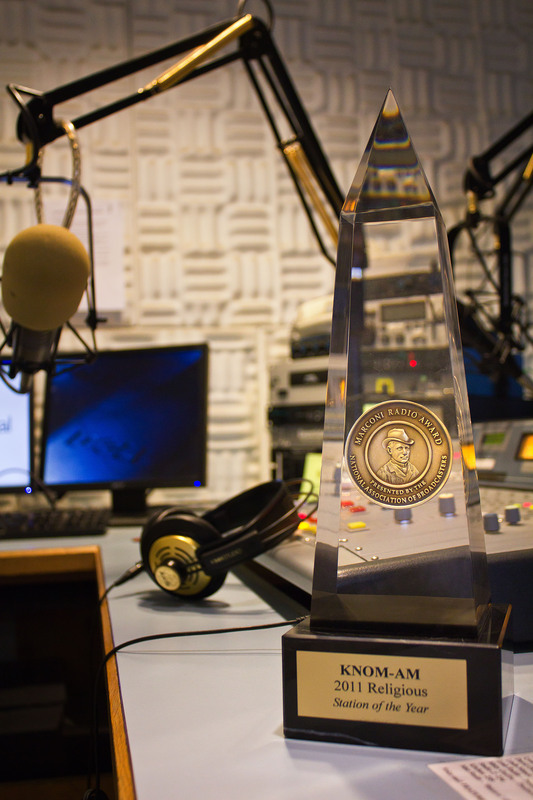 KNOM Radio has been awarded one of broadcasting's most prestigious honors: the National Association of Broadcasters' 2011 Marconi Award for Religious Station of the Year. Even being nominated for a Marconi would be headline-worthy; the award is open to religious broadcasting entities across America, and the competition is stiff. So you can imagine our great surprise when, at NAB's awards dinner this September, it was announced that KNOM had won the 2011 Marconi. 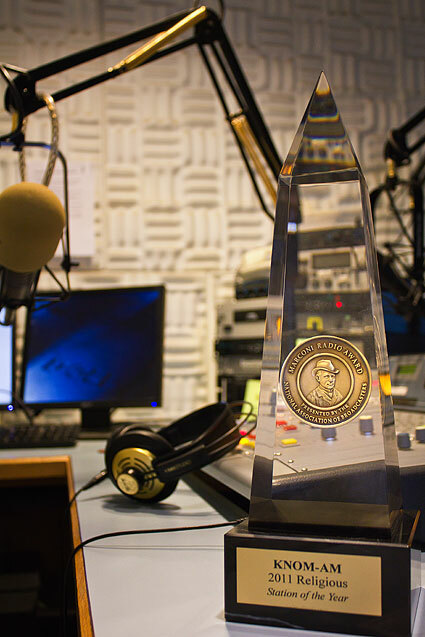 We're humbled to have been given this national award three times, and as always, we share this honor with all of those whose support, dedication, and generosity keep KNOM on the air. Thank you so much, and from all of us at KNOM, congratulations! Spirituality is not knowing what you want, but understanding what you do not need. At KNOM, we are continually blessed by the support we receive from our community: including from our community deejays, who volunteer for (unpaid) shifts on our airwaves and who bring a diverse array of backgrounds, personalities, and musical knowledge to our listeners. One such DJ is Nome's Tuesona Tungwenuk, pictured above, who co-hosts part of our Late Afternoon Show every Friday with volunteer music director Rebekah Pierce. Tuesona has also written, voiced, and produced a few of the PSAs (public service announcements) that we broadcast hourly. 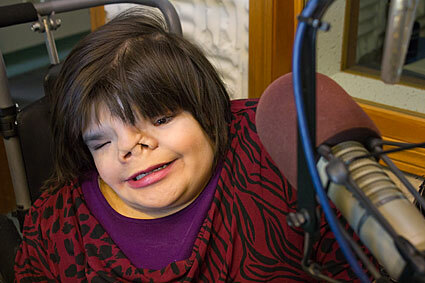 Tuesona says she's "liberated" by her wheelchair, and both on and off the air, she actively advocates for the disabled: insisting always that we should celebrate every person's unique abilities. We agree. 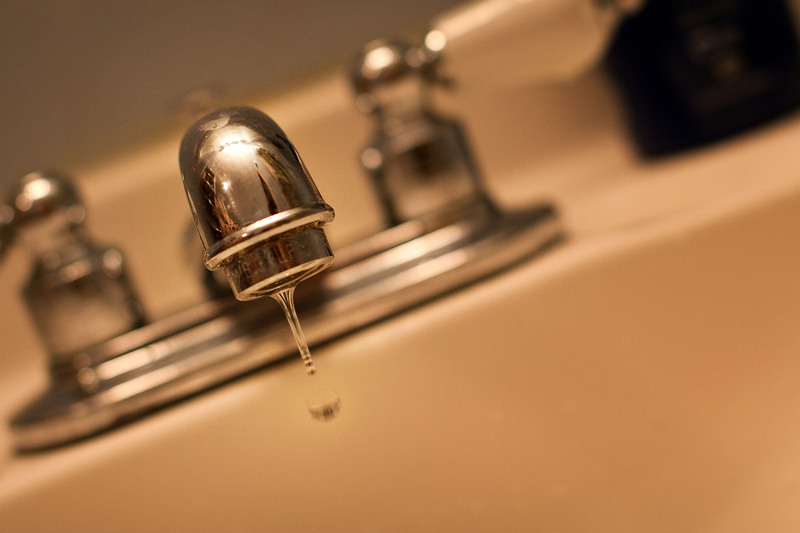 Listeners to KNOM this fall have already had many opportunities to sound off on issues that shape their lives: including the water they drink and the food they eat! 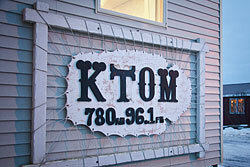 Through KNOM's weekly call-in shows – Sounding Board and Touchstone – our station has led conversations on the hotly debated issue of water fluoridation and on subjects ranging from the food served in Western Alaska's schools to public intoxication, bullying, and school truancy. As always, our talk show hosts never take sides or advocate particular viewpoints of a debate, especially on topics that are controversial or political. Rather, we offer a respectful, caller-driven platform for our listeners to make their voice heard. 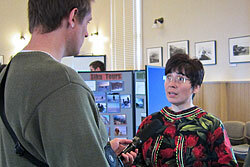 Thanks to you, rural Alaskans separated by hundreds of miles come together to share and shape their ideas on topics affecting their communities. We need prayer. We need prayer like we need air to breathe. Without prayer, we can do nothing. 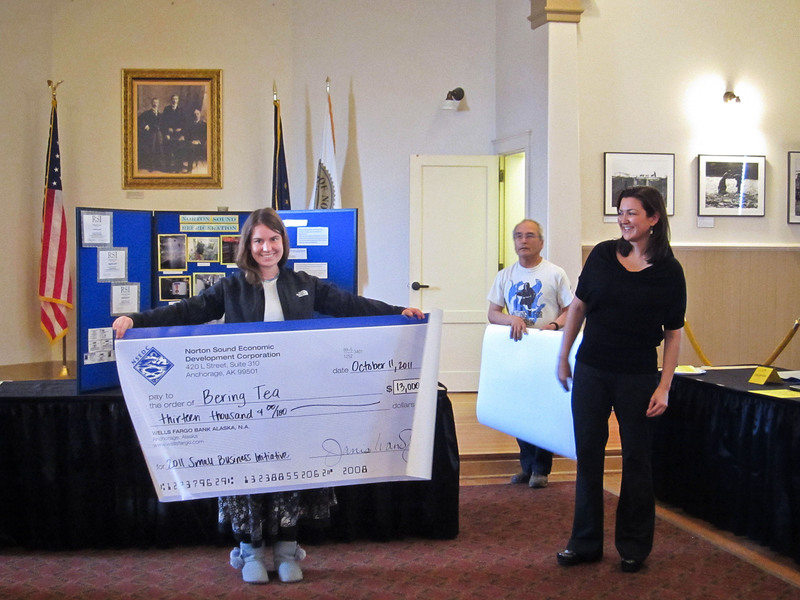 Although KNOM is strictly a nonprofit entity – a registered 501(c)(3), in fact – we were happy, last month, to report on some of the new business ventures helping to revitalize our local communities. 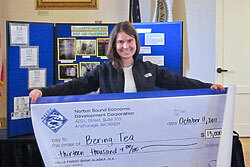 Our news department reported on the Western Alaskans who received grants as part of the Small Business Initiative of the nonprofit Norton Sound Economic Development Corporation (NSEDC). 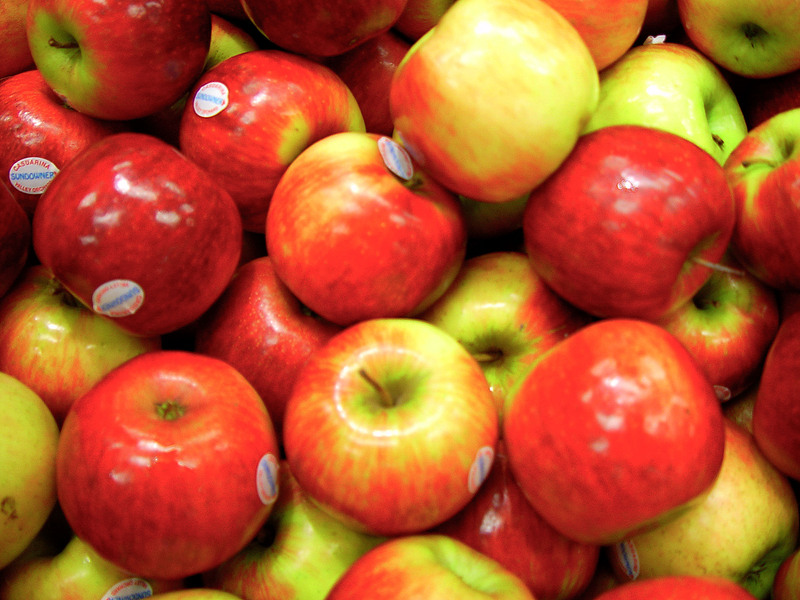 The startup businesses were diverse in scope: from refrigeration to tourism to food service. 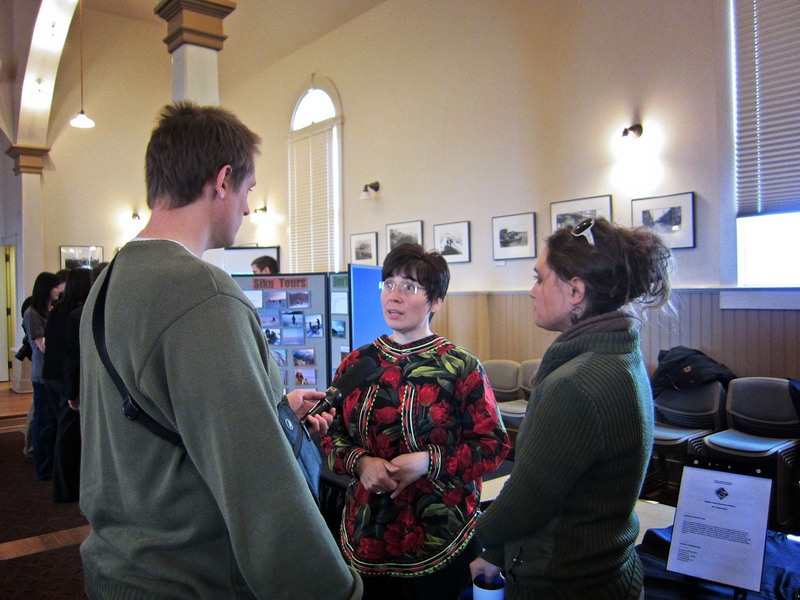 Among the winning entrepreneurs were Aurora Johnson (pictured at top interviewing with KNOM's Matthew Smith) and Erin Forton (photo at middle). Ms. Johnson hails from Unalakleet (YOU-nuh-luh-kleet), a village on the coast of Alaska's eastern Norton Sound, and her new venture, Siku Tours, will be aimed at providing authentic "Alaskan" experiences for visitors to our region. Ms. Forton – who has kindly voiced radio spots for KNOM! 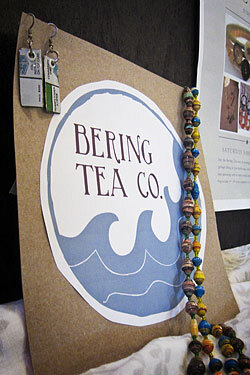 – plans soon to open a Nome coffeehouse and bulk-goods store called Bering Tea (see logo at bottom). With your support, we're able to report on projects like these that are bringing new opportunities to the communities we serve. 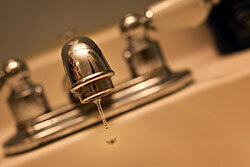 Any simple task or chore done in the name of Jesus can be a great dance of love. For just a few more weeks, some of our donors may be able to benefit from a special income-tax grace period for charitable giving from some types of IRAs. If you are a taxpayer 70 1/2 years of age or older, you can make a pre-tax, IRA contribution to KNOM if the gift is made by the end of 2011. This donation from an IRA to KNOM can be part of the required minimum distribution from traditional IRAs or Roth IRAs, but not from SEPS or Simple IRAs. 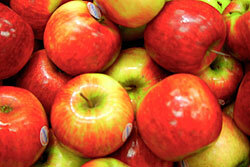 Please contact your IRA custodian or financial planner for more details. As we do every year, KNOM will take time this Veterans Day – November 11 – to honor the women and men who have served in the United States military. 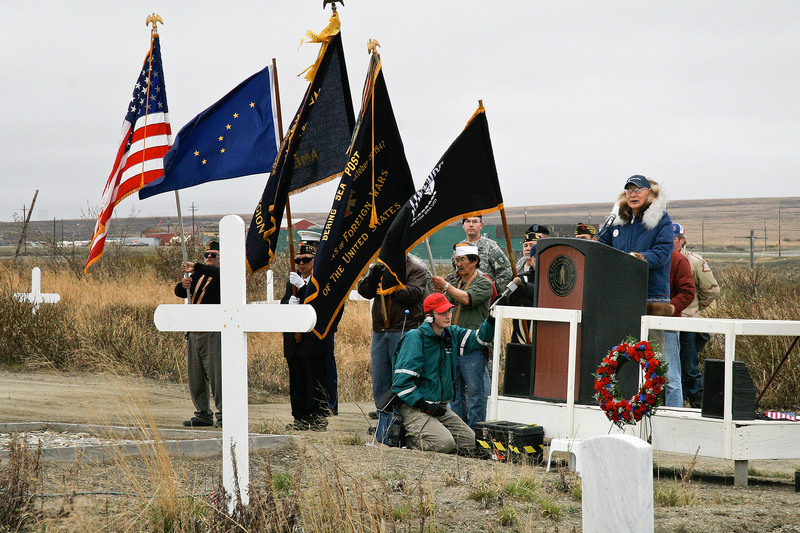 And we won't be alone: we'll be reporting, live, on the Veterans Day parade that will wind its way through Nome's streets. Thanks to you, listeners spread across 100,000 square miles of rural Alaska will be able to join the day's festivities. 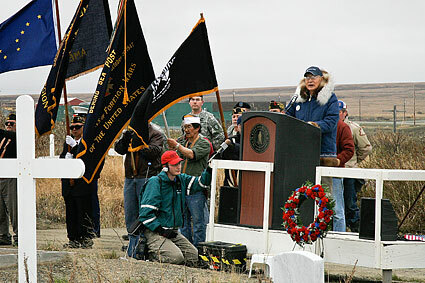 Photo: In 2007, volunteer Jesse Zink, kneeling, does a live broadcast of another day of remembrance – Memorial Day – with respected elder Dan Karmun at the podium. God will mend a broken heart if you give Him all of the pieces. 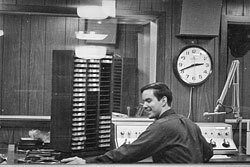 By the time you read this, it will be more than a year since the sudden passing of KNOM founder and dear friend Tom Busch: a broadcaster who dedicated his life to our mission and wrote in the pages of this publication through its November 2010 issue. 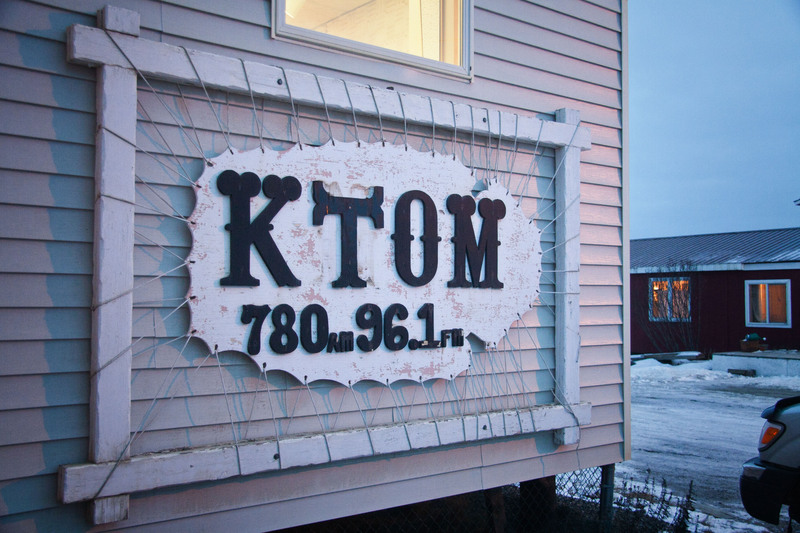 Although we will always be in Tom's debt for the countless contributions he made to life in rural Alaska, we're excited to report that Tom's legacy and one of his last goals for the station – its digital renovation project – are as vibrant as ever. The project would see KNOM's facilities expanded and its broadcast hardware converted from analog to digital; this will be essential to KNOM's future survival, since the digital equipment will be immeasurably easier and less expensive to maintain than our current analog hardware. We have already raised over $100,000 of the $600,000 we estimate will be needed for this project. We can't thank you enough for your generosity. 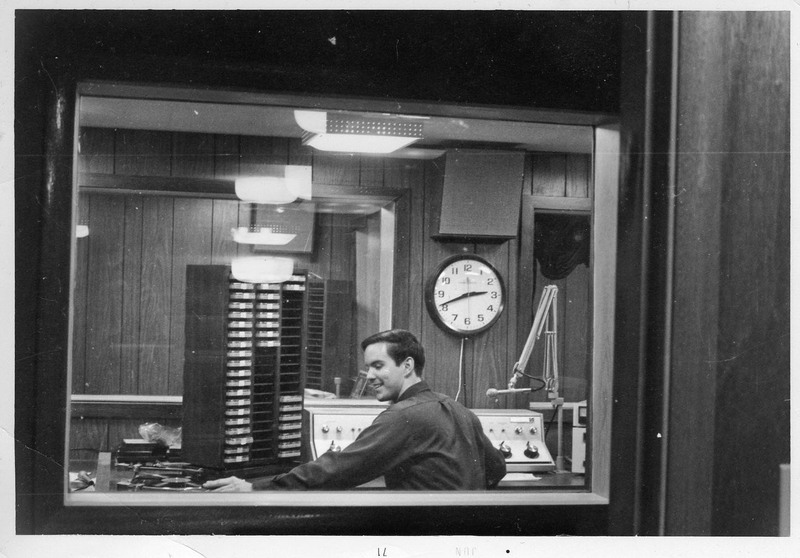 Photos at left: at top, a young Tom Busch deejays in KNOM's early days; at bottom, our current studio building's KNOM sign, which paid tribute to Tom – with "K-TOM" – for a few days immediately following his passing.